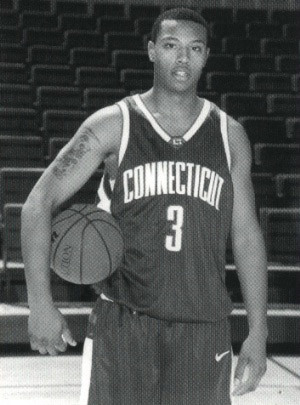 Caron Butler was a Forward for the UConn Huskies from 2000 – 2002. He was the leader of the team, and put them on his back on the Road to the Final Four in 2002 but was stopped by Maryland in the Final Eight. He prepared his young teammates so they were able to win the National Collegiate Athletic Association Championship without him in 2004. I had the pleasure of meeting Caron in October 2004 after a Los Angeles Lakers game where he reflected on his basketball experiences. Caron was humble during our conversation, but other accomplishments he didn’t mention while at UConn were scoring over 1,000 points in his two years and he was the third fastest to reach it. He scored in double figures 62 of 63 career games and has the best average in UConn NCAA Tournament history. He was a finalist for the Naismith Player of the Year Award, and the John R. Wooden Award, honoring the nation’s top collegiate player, named the Big East Co-Player of the Year, was unanimous selection to the All-Big East First Team and named to the National Association Basketball Coaches All-District I First Team. Upon declaring himself eligible for the NBA draft, he was selected 10th in the first round of the 2002 draft by the Miami Heat. Caron said it was a big change playing at the NBA level compared to the college level because in the NBA the guys are big, strong adults. His first year in the NBA he had a spectacular rookie season finishing third in the “Rookie of the Year” voting. His second year with the Miami Heat started out a little slow due to knee surgery. Once he was physically able to play he went on to play a crucial part in the Heat’s run to the NBA finals. During the off season of 2004 he was traded to the Los Angeles Lakers, being part of a trade for Shaq O’Neil going to the Miami Heat. He realizes a trade can happen to anyone, its business, he was wanted by the Lakers, and he’s looking forward to being a team player, and making some things happen. Caron wasn’t surprised that UConn won the NCAA Championship this year and although UConn has lost three of its starters from last season, Caron thinks this year UConn will go far into the NCAA Tournament—he predicts they’ll go to the Sweet Sixteen.